Suppose you have a broadband connection and no Wi-Fi router, but you have multiple devices to connect to the Internet. You can only connect the wire to your laptop and then share this connection with other devices using WiFi. I already wrote about Windows Internet connection sharing over a wireless ad-hoc network. But mobile devices (Wi-fi Enabled) will not be able to search and connect to that shared Internet connection over an ad-hoc network properly. If you want to share Internet connection on all devices including laptops and mobile devices, you will have to create a virtual wifi hotspot in windows based laptop. There are lots of free WiFi hotspot software to try. In this article, I will tell you the tools to create Wi-Fi hotspot on your Windows laptop and share the Internet with multiple Wi-Fi devices quickly. There are many tools available which can be used to setup a wifi hotspot in windows systems. I tried several hotspot software and here is the list of best WiFi hotspot software for Windows. You can download any of these hotspot software and sahre Internet connection with other computers. This tool also allows you to share videos using Wi-Fi so you can access them right from the smartphone browser. It also comes with easy to use user interface to make your more productive. Virtual Router is an opensource tool that can create a virtual software-based router on Windows 8, Windows 7 or Windows Server 2008 R2. By using Virtual Router, you can easily share your internet connection with any wifi device. This tool is easy to use. Just download it from the official website and then install it on your computer. Create a new network and select which connection you want to share. Even if this software is free of cost, it also doesn’t show any advertisement. It uses WPA2 Encryption and there is no way to turn it off. So, your network is always secure. Connectify is another nice tool for creating Wi-Fi hotspot. The free version of this software comes with fewer features and you need to buy the paid one for all features. It automatically detects your PC network and creates a virtual hotspot network with login details. You can manage your connected devices as well. It also includes an Adblocker that blocks ads from displaying on devices joining your hotspot. 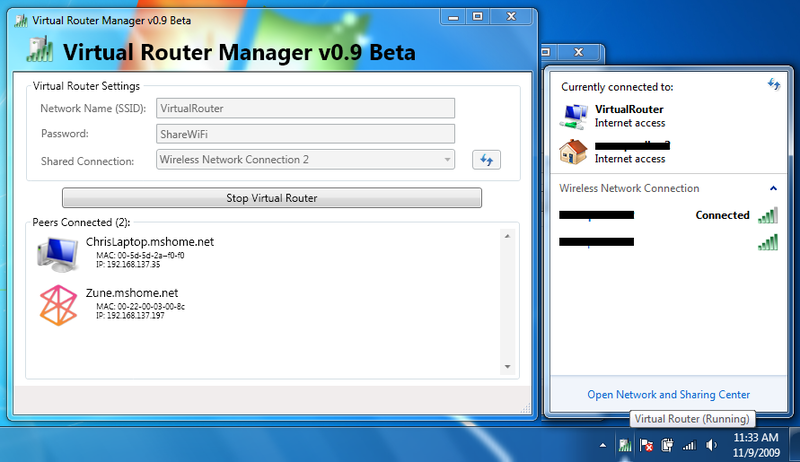 MHotspot is another nice tool that can create a virtual router in Windows systems. If you want to share Wifi with your smartphone, tablet or any other laptop, this tool can help you. This tool also has the ability to repair your driver in case not supporting virtual routing. I personally used this tool for sharing my internet connection with my Android phone when my router suddenly stopped working. This tool also gives you the details of connected Wi-Fi clients and their resource consumption. The best thing is that the tool comes with very small size and works with just a few clicks. Virtual WiFi Router is also a nice tool to create a wifi hotspot. you can create a wifi hotspot for Wifi reverse tethering for wifi supported mobile and laptops. Convert your Windows PC into a wifi hotspot for free of cost with this easy to use the tool. MaryFi is another free software to create Wi-Fi hotspot quickly on a Windows 7 PC. It also supports Windows 8 and Windows 8.1 computers. It has easy to understand user interface. It is free of cost and works well. Not just internet sharing, you can use it for normal file sharing and also connect other systems to play LAN games. This software also uses WPA2 encryption for security. It is compatible with Windows 7, 8 and 8.1 officially and not with latest Windows 10. Ostoto Hotspot is also a good free hotspot software for turning your Windows PC into WiF hotspot and share the Internet with multiple devices. You can share your WiFi, LAN, Ethernet or mobile broadband connection. It supports all available Windows versions including Windows 10, 8.1, 8, 7, Vista or XP. It uses WPA2 security for safeguarding your WiFi network. It is free but shows no advertisement. My Public Wifi is another good software ti turn your laptop into WiFi hotspot and share internet connection with other computers. It is free and perform well. It also features a strong firewall to restrict user access to specific servers. It features WPA2 encryption, so you can set a password to avoid unauthorised Internet access. It is compatible with Windows 7, Windows 8, and Windows 10. Download MyPublicWifi from this link. HostedNetworkStarter is a similar software developed by Norsoft for creating Wi-Fi hotspot. It is portable, so you can carry it with you in a USB drive and use whenever you want. As it doesn’t need installation, just run an use It supports Windows 7, Windows 8, and Windows 10 with 32 or 64-bit computer. 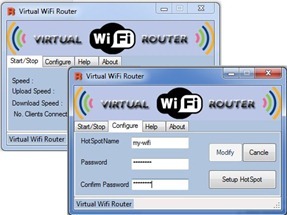 It is another popular software for making WiFI hotspot on your computer. It is a free software that doesn’t show ads as well. It also allows you add password on your network to prevent unauthorized access to the Wi-Fi. It is available for Windows 7, Windows 8, Windows 8.1, and Windows 10. Download 160 WiFi from this link. There are many other nice tools available which you can download from any popular software downloading websites. Download any of the tool added above and convert your system into a virtual wifi hotspot. If you know any other good tool, you can share that tool with us and I will add that to the list.